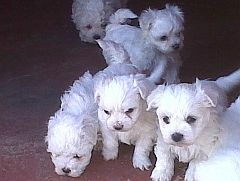 My first puppy ever was a Maltese Poodle. Her name was “Ploom”. She was my shadow. She came with me wherever I went. We were very involved in horse shows during those years therefore “Ploom” travelled all over South Africa with us. She made sure that she had front row tickets to every class that we participated in. She used to sit in the middle of the ring to give us her full attention and support. Over the years she became a familiar face amongst our fellow horse riders. Everyone loved her. 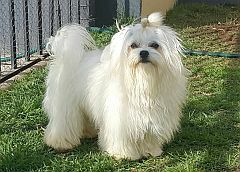 It took me over 20 years to get over her death, but today I am the proud owner of two Maltese that give me just as much love and affection as “Ploom”.